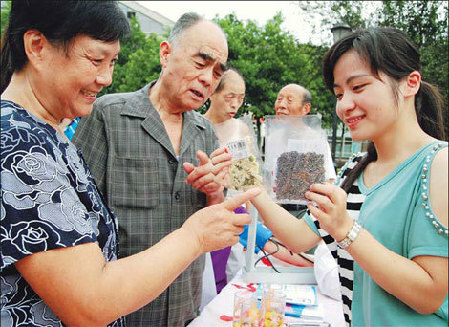 As the summer heat fades and autumn's gentle breeze provides welcome relief from the suffocating humidity, be aware of the health risks of the season, says Jia Haizhong, a traditional Chinese medicine (TCM) specialist at the China-Japan Friendship Hospital in Beijing. "A defining feature of autumn is dryness, which is most likely to affect the lungs and respiratory tract," Jia says. divided into two periods - the first is warm and dry, and the latter, severely cold and even drier. "The lungs and other respiratory organs are delicate and need to be hydrated. Dryness will cause discomfort and trigger coughs, colds and aggravation of chronic pharyngitis," Jia says. "It is critical for the body to have enough water." The most important thing is to drink enough water. In autumn, people tend to be unaware of the fact that they are losing water quickly, since they don't actually sweat. But, in fact, the dry air will cause water to evaporate from the body 24 hours through the pores, unnoticed. "Do not drink only when you feel thirsty, drink regularly," Jia says. He also suggests moderate watering of indoor areas, and using an air humidifier indoors to keep the environment moist. However, people with asthma should be careful with an air humidifier, as micro-organisms such as mites accumulated in the humidifier could aggravate the discomfort. Another way to make sure the body has enough water is eat what nature gives us in autumn, Jia says. As evolution has modified our bodies to adapt to the change of seasons, being in harmony with nature is the best way to stay healthy. "People should eat whatever is harvested in autumn - be it roots, tubers, seeds, fruits or aquatic products," Jia says. Seasonal fruits such as pears, apples, melons, and pineapples work best. Fruits that are not in season should be avoided. For instance, it is not wise to eat watermelon in autumn and winter. When eating pears, Jia advises against peeling the skin, saying that TCM believes pear skin is beneficial to the lungs. The residue of pesticides on the skin should not be a big concern, he says, pointing out the pesticides are not used all-year round; besides, the farmers themselves eat the fruits, and will not exceed safe limits of usage. It is equally important to help the body retain water and for this nuts work well. Nuts, such as walnuts and almonds, are rich in fat, and thus help preserve body moisture, he says. It is also important to keep the immune system on track, Jia says. "When the temperature drops, the body's immunity also drops. So it is critical to keep the body warm," he says. "Keeping healthy is actually all about being in step with nature. Wear more clothes when you feel cold, and go lighter when you feel hot." For people with cardiovascular diseases, low temperatures can trigger high blood pressure and coronary heart disease, so keeping warm is extremely important.